Smith & Hennessey PLLC was formed in April 2000 by James A. Smith, Jr. and James R. Hennessey, both of whom had been partners in Smith & Leary PLLC. Messrs. Smith and Hennessey have a combined 71 years of litigation experience in a wide variety of contexts. Mr. Smith’s background includes his former partnership in one of the largest law firms in Seattle. From 1982 to date Mr. Smith has been a principal in his own law firm which, during that time period, has represented individual and corporate clients in complex litigation in Washington and in other jurisdictions. After beginning his career as a prosecuting attorney in King County, Washington, Mr. Hennessey has practiced civil litigation, specializing in tort and commercial litigation. Like Mr. Smith, his experience transcends the state of Washington and he has successfully litigated in a variety of other jurisdictions. Smith & Hennessey PLLC was founded on the principle that the size of a firm is not commensurate with the quality of legal services provided to clients. Our use of a team approach to litigation, coupled with high quality and technically proficient litigation support staff, has allowed the firm to handle many multi-million dollar disputes to a successful conclusion for our clients. We have litigated in a variety of jurisdictions throughout the United States. Our lawyers have argued cases at every level of the Washington state and federal systems, including the United States Supreme Court. Smith & Hennessey PLLC provides personalized legal services in a highly efficient, responsive, and cost-effective manner. It provides the sophistication and legal expertise of a larger law firm, while maintaining the important attorney-client relationship which often has been overlooked in our profession. In addition to our litigation experience, Smith & Hennessey PLLC provides general counseling services to a number of valued clients. We also possess experience in conducting independent corporate investigations and internal reviews. Our experience with respect to litigation also provides us with the ability to proactively advise our clients regarding the avoidance or early resolution of disputes. Our primary emphasis, however, is in litigation. We have represented a wide variety of individuals and corporations in connection with our practice. Some of our more easily recognizable clients include: Car Toys, Inc.; Wells Fargo Bank; Moss Adams LLP; Glimcher Realty Trust; ING North America Insurance Co.; Ingram-LeGrand Lumber Company; Koncor Forest Products; Matsushita Semiconductor Corporation of America; Northern Life Insurance Company; North Pacific Crab Association; Northwestern Trust; Pacific Seafood Processors Association; Panasonic Factory Automation; ReliaStar Life Insurance Company; Renaissance Health Care, Inc.; Rich Xiberta, S.A.; USG Annuity and Life Company; Walgreen Co.; and Denkmann Associates. We represent both plaintiffs and defendants. All of our cases have been unique, and we treat them that way. Our lawyers have handled litigation in a variety of locations throughout the country, including Washington, Oregon, Alaska, Colorado, Louisiana, Georgia, Mississippi, California, Hawaii, Washington DC and other jurisdictions. 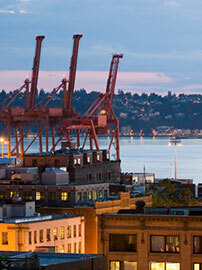 All of our attorneys are admitted to practice in the State of Washington, and two are admitted in California. Frequently, we act as co-counsel with other firms. In such situations we ensure that the client’s work is performed by such firms in a manner best calculated to be cost-effective and to lead to a successful result for our clients. Smith & Hennessey PLLC has offices located in, and overlooking, the most beautiful part of the Pioneer Square District of Seattle. The location and décor of our offices is consistent with the professional, yet informal, attitude of our firm. Our offices are a few blocks from the King County Courthouse and within walking distance of all the office buildings in downtown Seattle. Our building itself is located on a tree-lined, brick pedestrian mall and is in a cosmopolitan setting surrounded by art galleries, coffee shops and bookstores. Our billing rates are determined by the professional involved, the nature of the representation and the particular service being provided. We represent clients on a variety of different bases, including contingent fee and mixed hourly contingent fee, as well as the more traditional hourly fee structure. We welcome creative fee arrangements. Accountability to our clients is a key aspect of our practice. We fully inform each client regarding the professionals involved in working to meet their needs. Our use of the team approach as a key method of litigation representation allows us to be cost-effective for our clients. Our legal assistants, secretaries, word processors, document clerks and administrative personnel are a key component of our practice. We have an exceptionally motivated staff who contribute to the creation of a high quality professional work product on behalf of our clients. We use a team approach to client representation, allowing us to furnish legal services to our clients on the most cost-effective basis. The size of our firm and the quality of our attorneys allow us to provide highly sophisticated, responsive, personalized service to our clients. We pride ourselves on the exceptional quality of our work and our clients. This is what we believe sets us apart from other law firms. We are committed to assisting our clients in effectively resolving their legal problems through trial or settlement.